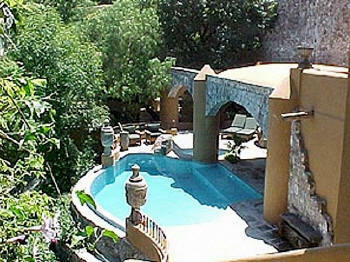 This showcase property, featured in various architectural magazines, boasts exquisite furnishings, a professional staff of 4, and magical landscaping amidst magnificent gardens that are unique in all of San Miguel. 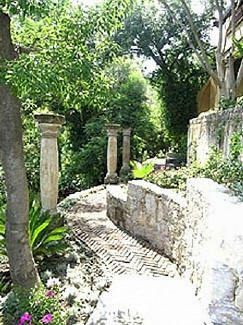 This showcase property, featured in various architectural magazines, boasts exquisite furnishings, a professional staff of 3, and magical landscaping amidst magnificent gardens that are unique in all of San Miguel. 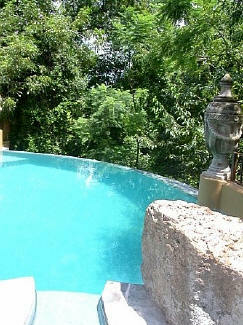 Dramatically sited atop a small hill above the Centro of town, Villa el Cerrito encompasses a main house with four spacious bedrooms as well as a separate casita that has two queen bedrooms. This stunning villa can be rented in different price categories ranging from use of 3 bedrooms in the main house (for a party of 1 to 6 people) to 4 bedrooms for up to 8 guests.... see pricing structure listed below. 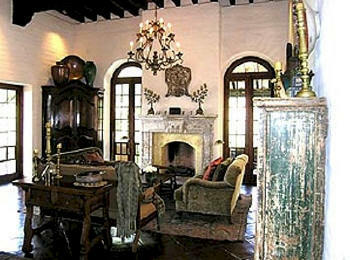 Villa el Cerrito was entirely hand-built over a five-year period. 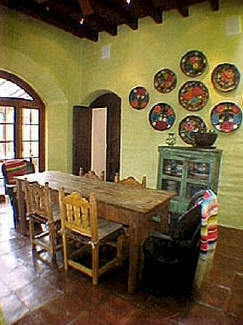 Considered the signature work of one of San Miguel's most prominent architects, this authentic adobe estate masterfully combines an ancient building style with all the modern conveniences and amenities expected by today's most discriminating travelers. 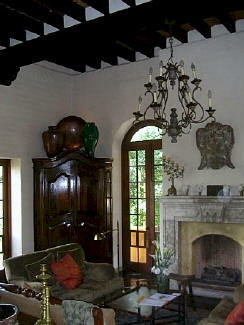 The interior of the villa was designed by the owners, working together with one of San Miguel's top interior decorators. Every room received the utmost attention to create an elegant, comforting, luxurious and authentically Colonial Mexican environment. 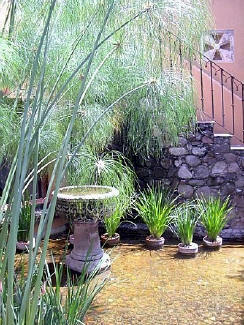 One enters the main house through a lovely courtyard that features a small pond lushly accented with papyrus and palms, including a stone fountain. The foyer leads you to the elegant formal dining room and the grand sunken living room. 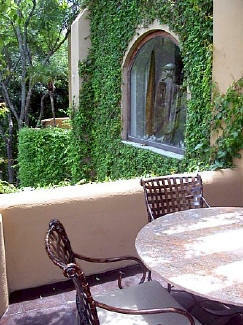 Both rooms have picture windows overlooking the gardens and high beamed ceilings. 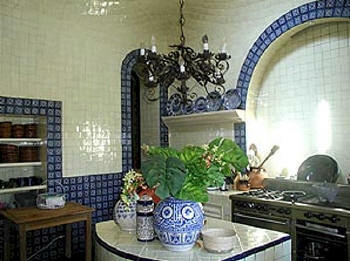 This level of the house also has the wonderful tiled, dome-ceiling kitchen (the domain of professional chef Leticia) and a bright and sunny breakfast room with adjoining open-air dining terrace. A larger covered terrace is off the living room, comfortably appointed with cozy chairs and a fireplace for leisurely outdoor living. A most gracious powder room is off the entry foyer, and one also enters the master suite across a small bridge from the living room. This wonderful retreat includes a queen bed outfitted with the finest linens, a fireplace, a large tiled bathroom with circle tub, and a separate dressing room with plenty of closet space. From the covered terrace, you can continue down one level to the pool terrace, complete with its dramatic infinity edge and an adjoining spa. The outdoor loggia alongside the pool includes both comfortable seating and sunning areas, a sound system and a wet bar with refrigerator. The location of the pool along the hillside allows you to literally swim among the treetops while overlooking dramatic gardens, ponds and fountains below. 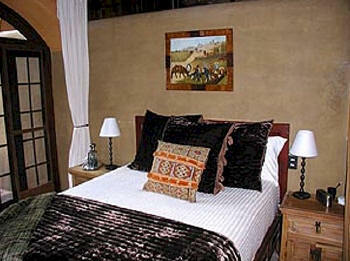 Downstairs in the main house, you have two other spacious queen bedrooms with en-suite bathrooms. One of these guest rooms has a loft area for sleeping with sunken sitting room below. 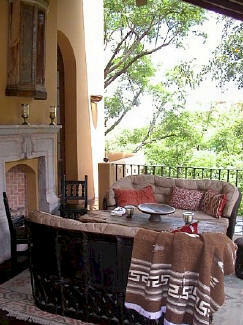 The other features a lovely terrace with cushioned reading nook overlooking the gardens below. At the upper, rooftop level of the main house, there is a roof terrace with potted plants and outdoor furniture, plus access to another bedroom with two twin beds, its own bathroom, and a small study with Internet connection. 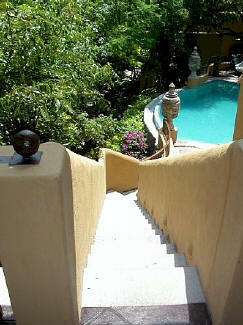 Across a Venetian-style bridge from the pool terrace is the separate casita, a world unto itself. This charming cottage has a living room with its own TV and DVD player, a small kitchen, and two bedrooms with queen beds and en-suite bathrooms. There are numerous outdoor balconies, terraces and patios, affording the indoor/outdoor living for which San Miguel is so famous. 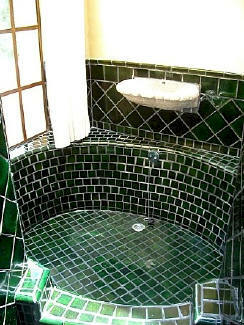 The magic of Villa el Cerrito is brought to life by an extremely professional, friendly and able staff trained to make your stay as pleasurable and fulfilling as it can possibly be. 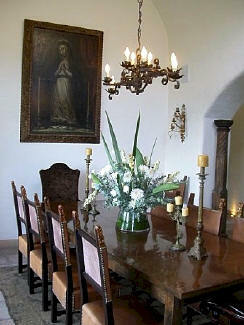 San Miguel House rentals provides a food-stocking service, should you want home-cooked meals prepared by Leticia. Her cooking service for breakfast and mid-day comida is included in your rental fee, but you pay extra for food and beverages, depending on what you want her to prepare. 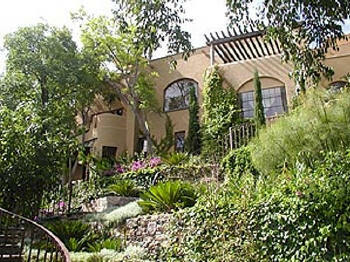 The other staff members include a household maid who cleans and does laundry, and a gardener. The staff come daily from 8 am to 3 pm on Monday through Friday, and from 8 am to 12 noon on Saturday and Sunday. The cook can prepare and serve comida on weekdays, but only breakfast on the weekends, although she can also prepare and leave snacks for the afternoon. 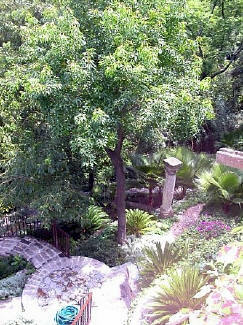 The terraced grounds integrate a cornucopia of gardens, fountains, walking paths, seating areas, meditation spots, ponds, pillars, vegetation and other natural and man-made wonders. 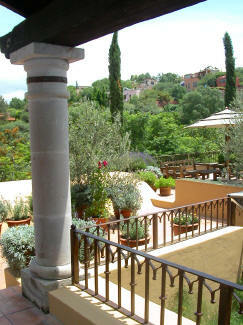 Perhaps the home's most exceptional outdoor feature is a acoustically impressive Roman amphitheater where performers, singers, musicians and mariachis can serenade you from below the villa. Conceived by a master New England landscape designer and created by San Miguel's premier landscape architect, the garden setting of Villa el Cerrito is a work of art onto itself, a true luxury to be explored and enjoyed at your leisure. 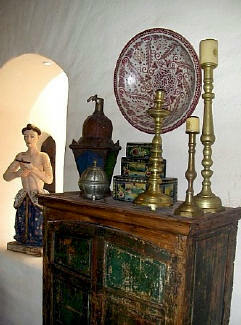 * Choice of bedrooms must be made upon arrival; then remaining bedrooms will be locked off. 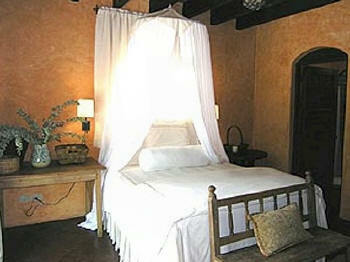 The casita has 2 queen beds, with a maximum occupancy of 4 people.